This was my fourth straight book-reading weekend--this time at McNally Jackson Bookstore in SoHo, a block away from the Dean & Deluca where Felicity worked. If you know what that means you're a child of the '90s. I hate making little kids sit still, because God knows I can't, so at the end of the reading I asked if anyone knew any ninja moves. 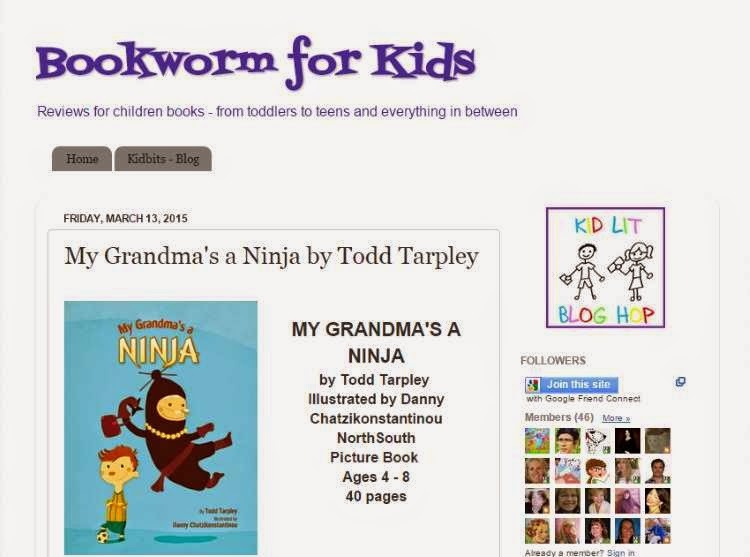 A little boy raised his hand and said he wanted to do a ninja flip. I said, "Really? An actual flip?" He said, "Uh-huh." So I helped him do a slow-motion flip, to the delight of the audience. 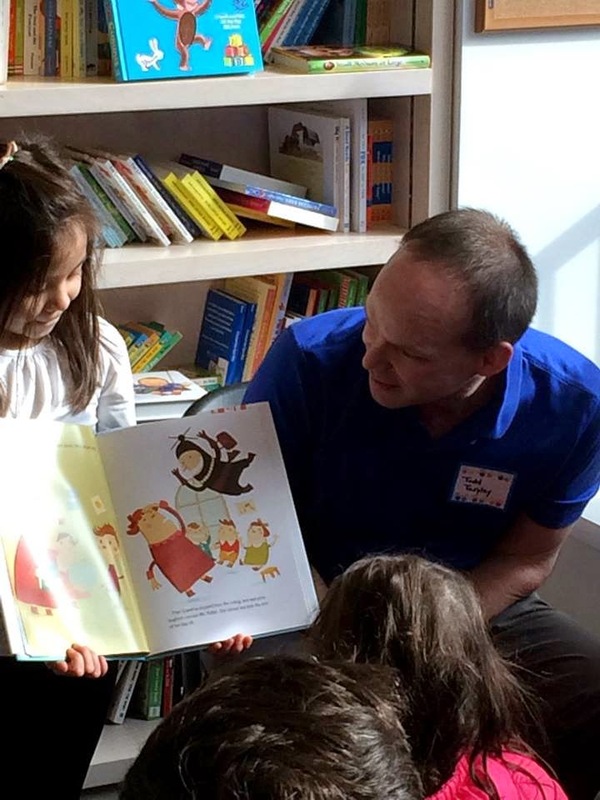 At which point a little girl raised her hand--she also wanted to do a ninja flip. So we did. Then several other kids raised their hands. At which point I had to cut it off for fear of increasing the book store's insurance premiums. 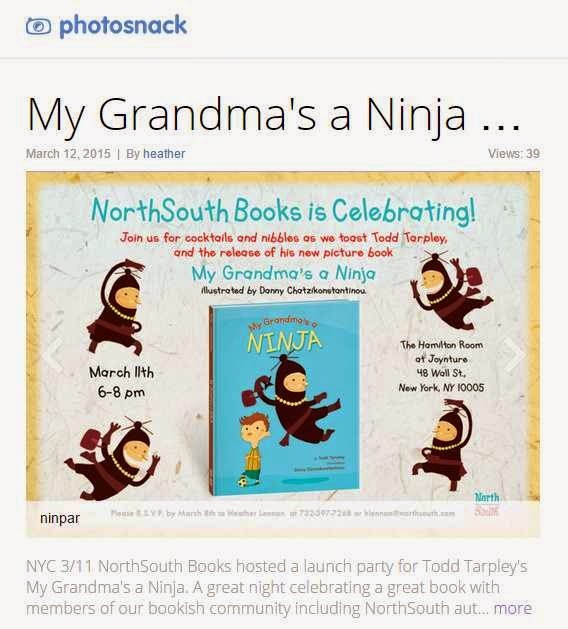 I'm guessing Jamie Lee Curtis and Julie Andrews don't have interactive ninja flipping at their book readings. Later Jen and I went out for dinner and stopped by B&N for coffee and dessert (and secretly to see if my book was out on the New Releases table or hidden spine-out in the A-Z shelves). Okay--on the table. Good. Not flagged as a Top Pick, but, you know, let's not get greedy. I graciously accept my plot of table real estate with my neighbors, Rex Finds an Egg! Egg! Egg! and Cat & Bunny. 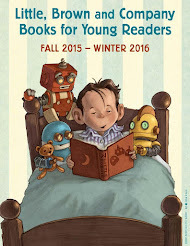 We are small but happy cogs in the competitive ecosystem known as children's books. Ethan got accepted off the wait list to his first-choice high school. It's called Little Red School House & Elisabeth Irwin High School--LREI for short. It's private. Ethan also got accepted to his first-choice public high school. So Jen and I had a conversation about it. Should he get a perfectly good education for free? Or should we go further into debt for the next four years so that Ethan can go to his dream school? And what about college for Samuel in a year-and-a-half? What about college for Ethan in four years? Jennifer anchors me to Earth. If not for Jennifer, I would have ten kids and six dogs and be three times bankrupt. She has been a stabilizing force for me. In return, I have been a de-stabilizing force for her. This has proven to be very good for both of us. I'm a big believer in logic and reason, but I'm an even bigger believer in heart, because life is short, dammit, and if you wait for everything to make sense, you'll find yourself at the end of the road having never taken a chance, never having your heart broken, never having done something impulsive and crazy that later you either say, "Damn, that was stupid," or, "Damn, I'm glad I did that." So Ethan's going to LREI. And that's just that. I could probably write a good Barry Manilow parody with that title, but no one under 50 would get it. We did spend the weekend in New Jersey, and it was a nice mini-vacation. 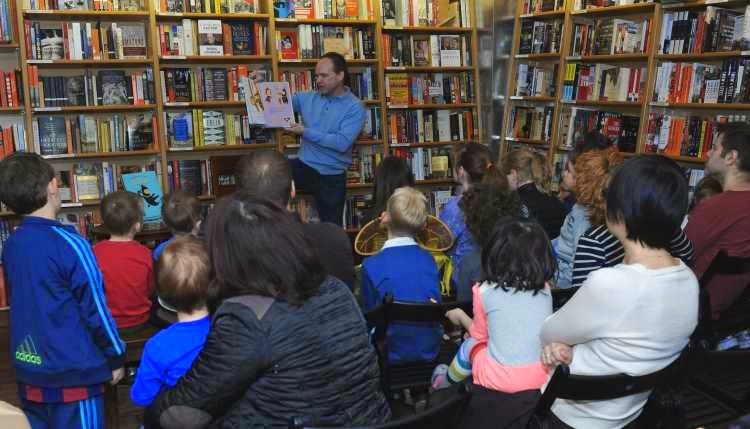 I had a Saturday morning book reading at Watchung Booksellers in Montclair, a great little book store in a great little town. About a dozen kids showed up, including an enthusiastic 4-year-old boy with a Spider-man sweatshirt who luckily was also into ninjas. Two little girls who used to go to Ethan's school also came. 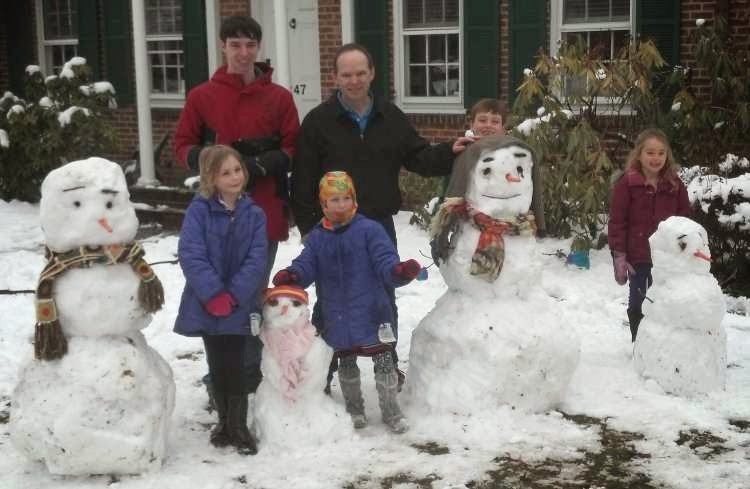 After the reading we went to their house for a snowball fight and snowman building while Ethan played games on his phone and ignored us. Samuel and I are over-sized kids. Ethan? He's a teenager; he has out-matured us both and is simply biding his time until college. 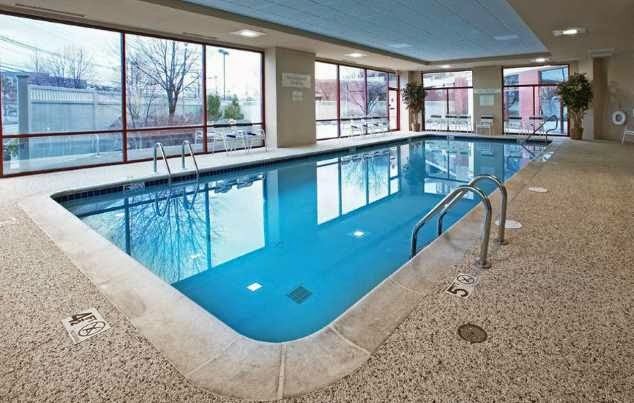 In fact, when we got back to the hotel and went to the pool, Ethan waded in halfway, then said, "You know, swimming pools were more exciting before smartphones were invented." But we got to spend some quality time together, have a sushi dinner last night, sleep late this morning, and have brunch at a real Jersey diner before heading back home to Manhattan in time for a Sunday afternoon run. 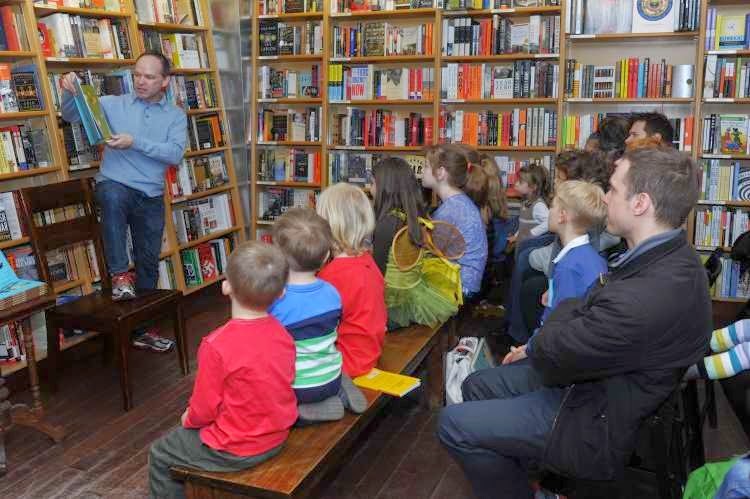 First and foremost, NorthSouth Books, my publisher, hosted a launch party this week--here's the slideshow. 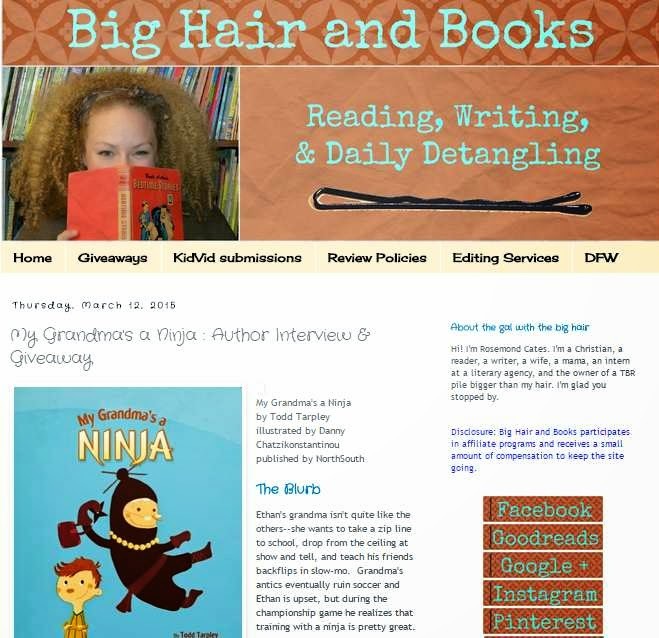 Big-haired Rosemond Cates from "Big Hair and Books" published an in-depth author interview and book giveaway yesterday. 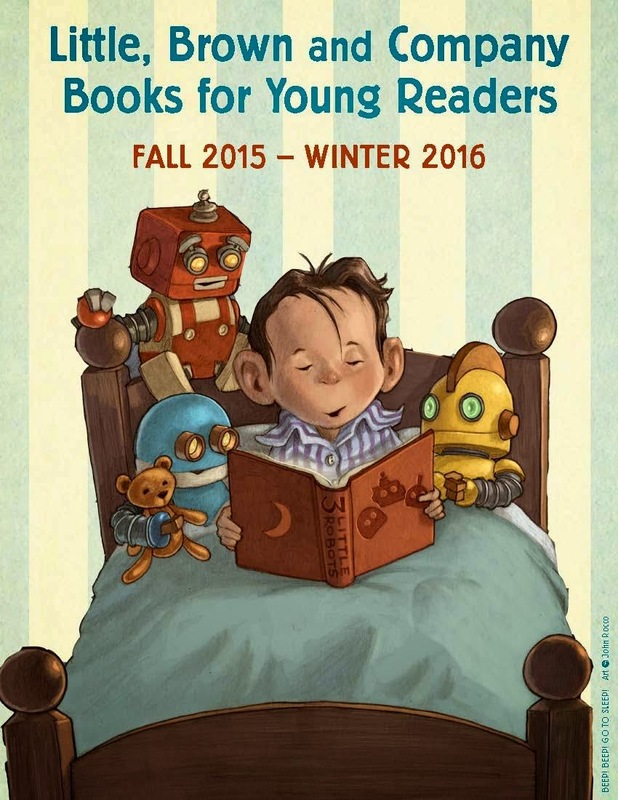 Bookworm for Kids said it's "one of those books that will have to be read again and again and again and again." 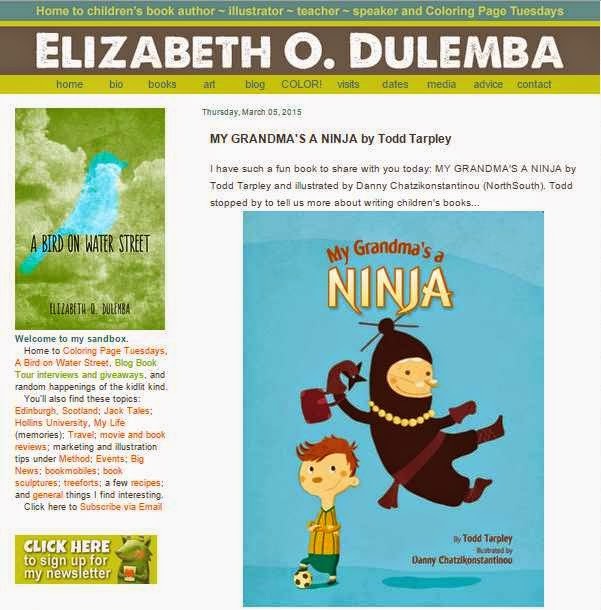 Elizabeth Dulemba of the aptly self-titled blog "Elizabeth O. Dulemba" graciously allowed me to do a guest post. 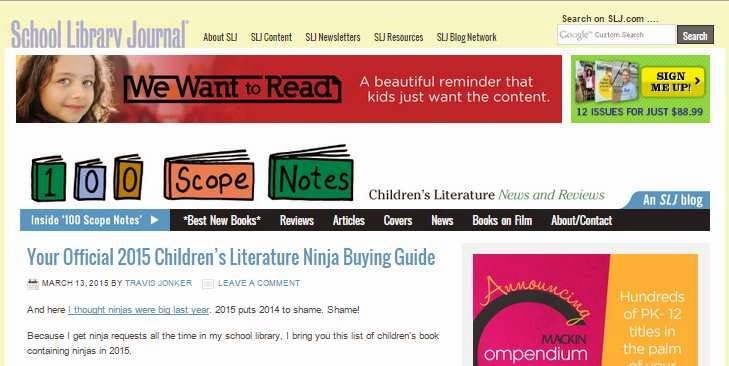 100 Scope Notes, part of School Library Journal's blog network, included Grandma in its round-up of recently published, ninja-themed children's books. 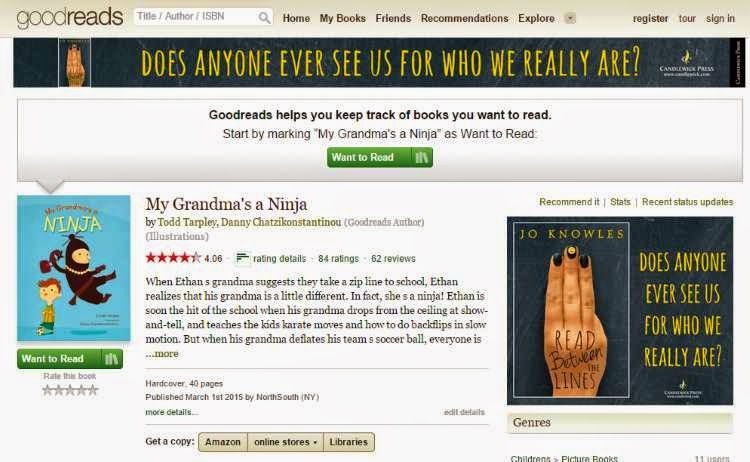 Goodreads already has 84 ratings and 62 reviews of Grandma (4.06 average, which I think we can all agree rounds up to an even 5). 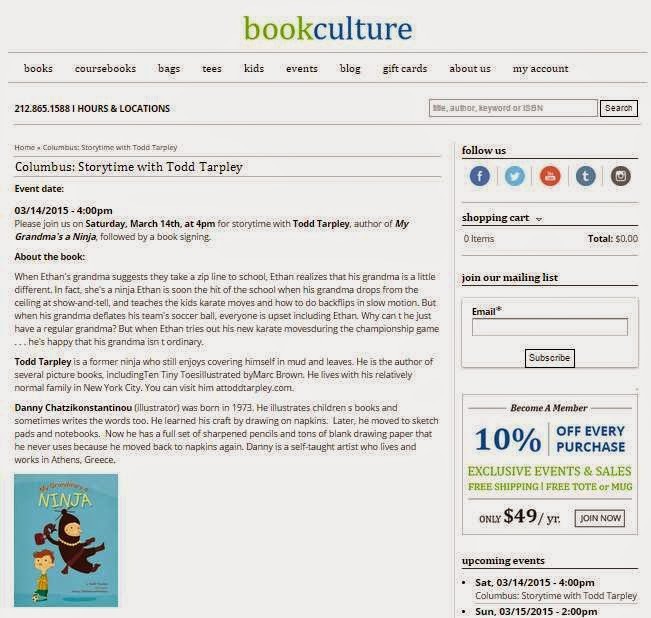 Finally, CityGuideNY.com, NYMetroParents.com, and BookCulture.com have all actively promoted my storytime reading and signing tomorrow afternoon at Book Culture. 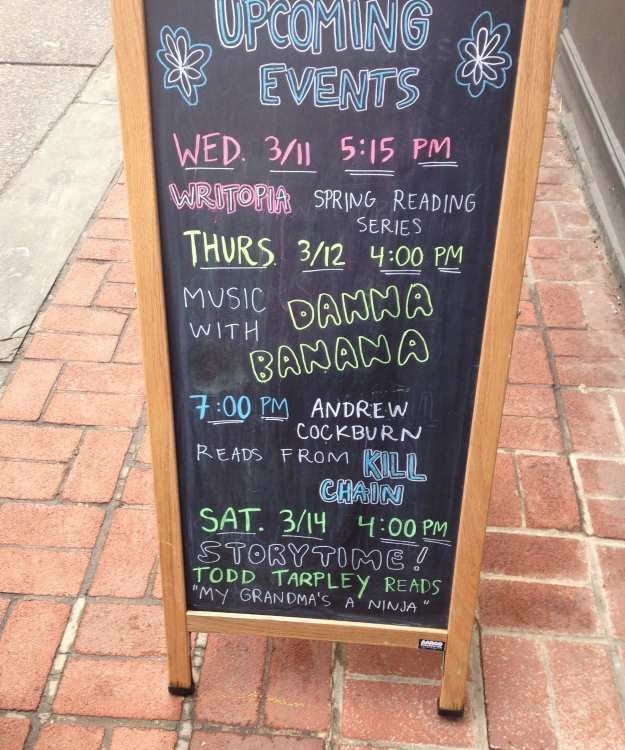 And thanks, Book Culture, for the sandwich-board sign--somebody sent me this photo! 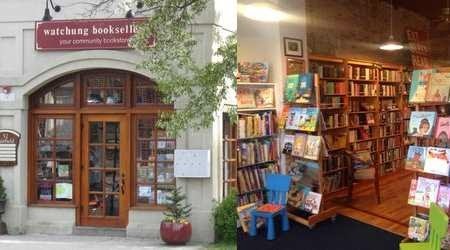 Now let's go sell some books! 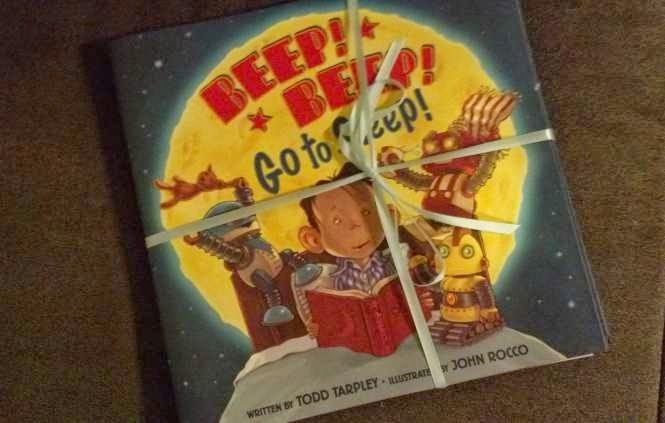 Look what I got in the mail this week from Little, Brown...Beep! Beep! 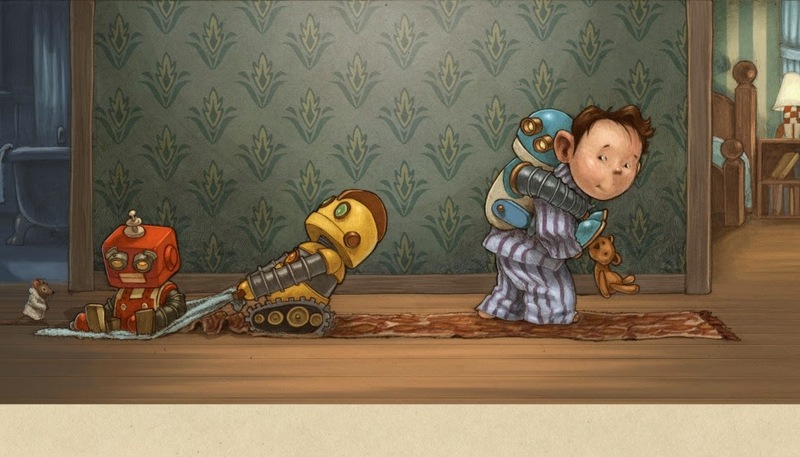 F&Gs. F&G stands for folded & gathered, which is the entire finished book, but unbound. 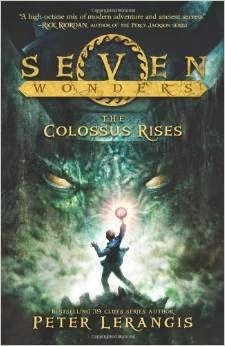 It's like a cross between a book and an amoeba. Or what a book would look like if Salvador Dali controlled the publishing industry. 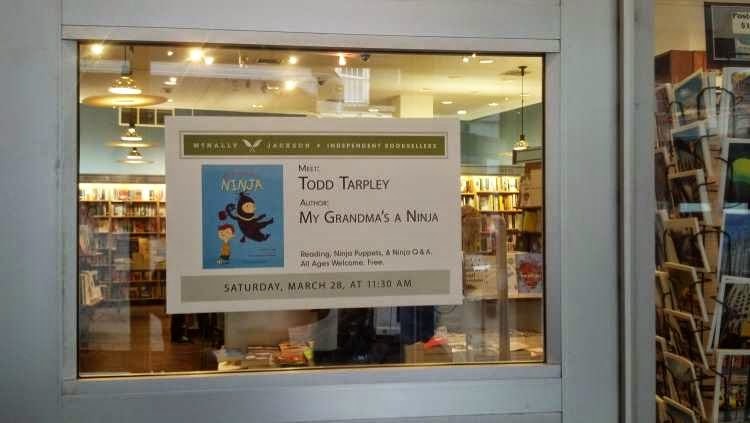 It's not coming out until September, so, shhh...let's focus on getting My Grandma's a Ninja to the top of the best-seller list first. I just have impulse-control issues. 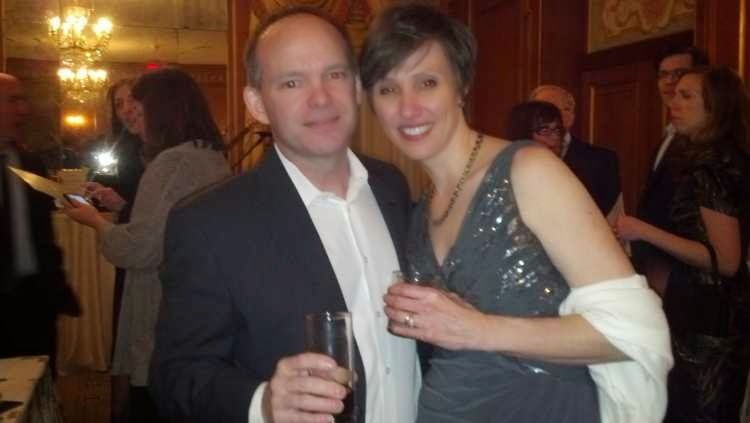 Friday night was the Studio School Gala. 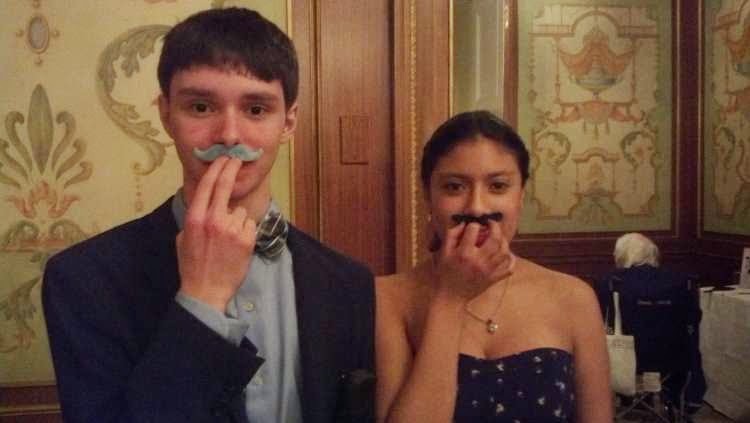 Everyone wore their fanciest mustaches. 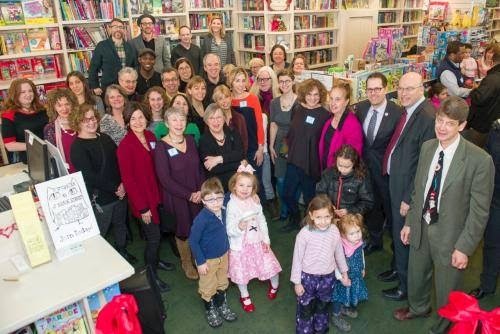 Saturday morning I attended the grand opening of Bank Street Bookstore with other local authors. That's me deep in center field near the warning track. I sneaked (I really want to say snuck) home to watch the first round of Big-10 wrestling on the Internet, went for a run in the park (kinda sunny! 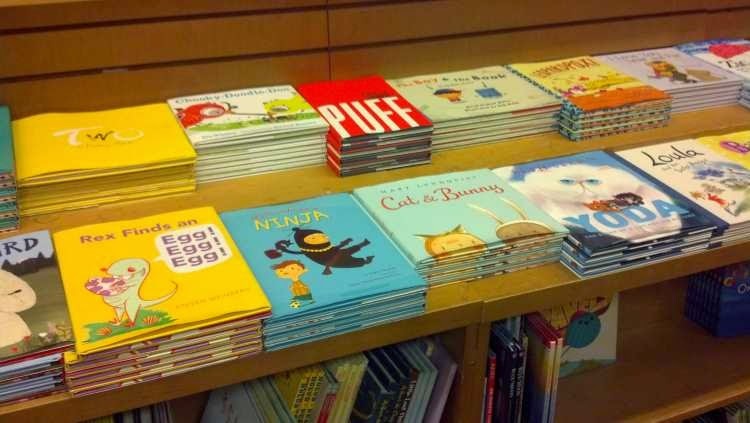 ), then back to the bookstore for afternoon storytime. Then home again just in time for Ethan's birthday party. 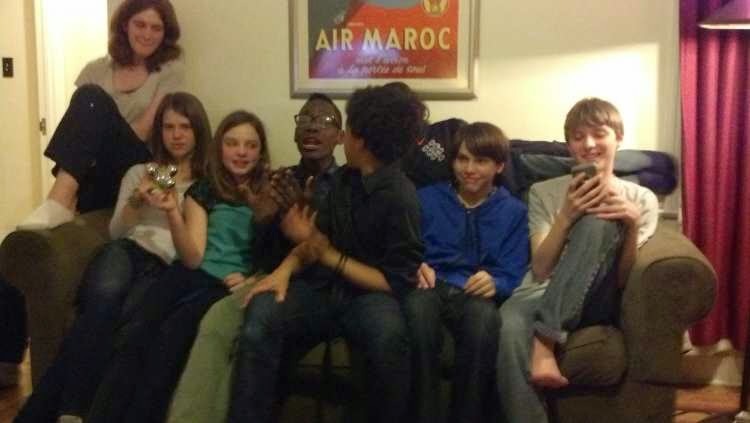 I call this photo "How Many Teenagers Can Fit on a Sofa?" 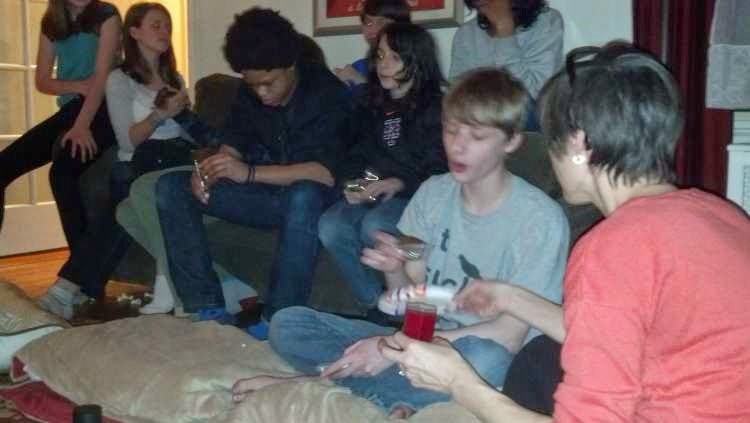 So our boy is fourteen. The Hawks are Big-10 co-champs. 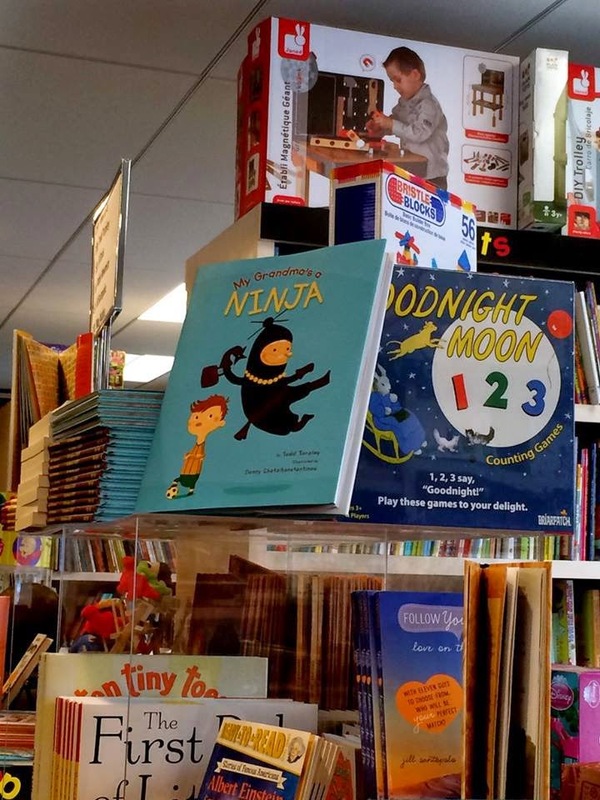 My Grandma's a Ninja is on the shelves. No complaints. First of all, who even knew there were 30 authors on the UWS? And by 30 authors, I don't mean one guy who self-published a book of limericks and 29 people who attended a creative writing seminar at The Learning Annex. There are some heavy hitters here. 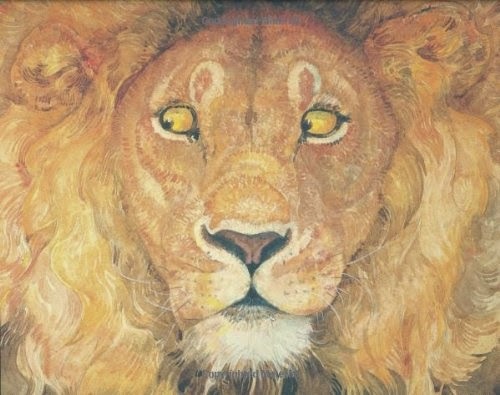 Caldecott winner Jerry Pinkney. 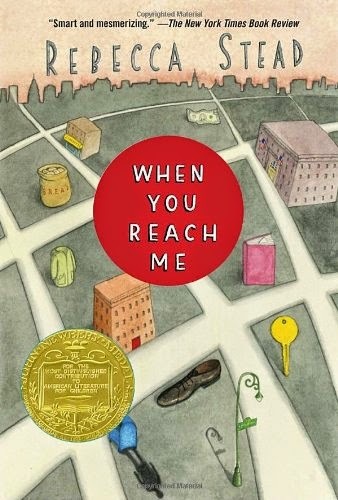 Newbery winner Rebecca Stead. Seven-time NY Times best-selling author Peter Lerangis. This isn't the farm team. In fact, I don't even mind not being the center of attention. I'm pretty psyched to be one of the 30. BTW, this is exactly what's so cool about living in NYC.